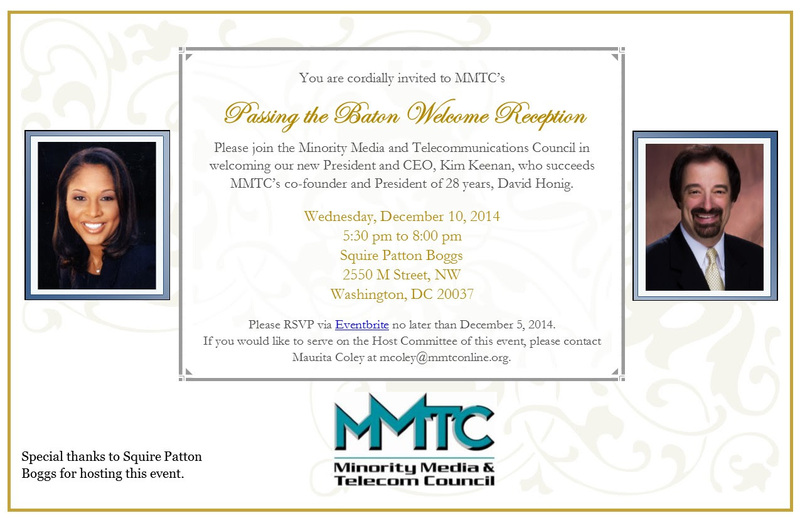 SAVE THE DATE To Celebrate David Honig's "Passing the Baton"
Please join the Minority Media and Telecommunications Council in welcoming their new President and CEO, Kim Keenan, and acknowledging the leadership of MMTC's co-founder and President of 28 years, David Honig, during their "Passing the Baton" Welcome Reception! Kim joins MMTC from the NAACP, where she served as General Counsel and Secretary. A talented lawyer and advocate, Kim is an extraordinary leader who has served as President of the 100,000 member District of Columbia Bar Association as well as the National Bar Association, which is the oldest and largest national association of lawyers of color with a network of over 60,000 lawyers, judges, educators, and law students. Among other priorities, Kim will address the need to improve diversity in Silicon Valley and beyond, remove education and health disparities through technology, preserve an open Internet, close the digital divide, and improve the images of people of color in all media. Kim, who is known for her deep commitment to mentoring next generation leaders, also has plans to strengthen and expand MMTC's training and professional development programs for lawyers and entrepreneurs. MMTC would like to extend a special thank you to Squire Patton Boggs for hosting this event. If you would like to serve on the Host Committee of this event, please contact Maurita Coley at mcoley@mmtconline.org. We hope you will join MMTC in such an important occasion!